Red Bull design chief Adrian Newey turned down an attempt by Ferrari to persuade him to join the Italian team. Ferrari approached the 52-year-old, regarded as the best design engineer in Formula 1, last year. But they did not get as far as offering him a job because Newey made it clear he was not interested in leaving Red Bull to move to Italy. Newey is understood to have since extended his contract with Red Bull for at least another three years. Red Bull team principal Christian Horner said: "It's understandable why any team in F1 would be interested in Adrian but he is very much enjoying life at Red Bull and I'm sure he'll be here for years to come." Ferrari team principal Stefano Domenicali said in an interview with Italy's Gazzetta dello Sport on Thursday: "Of course, Adrian is one of the best, if not the best, in F1. "We joke a lot about the possibility [of him joining Ferrari] but I have the impression he is happy in England and that he will stay at Red Bull." 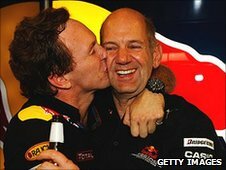 BBC Sport understands that Ferrari phoned Newey twice in 2010 with a view to exploring whether he was interested in a move to Maranello. But the conversations, while amiable, did not even get as far as discussing how much Ferrari might be prepared to pay Newey as salary. It is not unusual for F1 teams to approach drivers or members of another team with a view to sounding them out about their future and staff regularly move from team to team. Ferrari last year employed two key members of rival top teams - McLaren chief engineer Pat Fry, who is now Ferrari's deputy technical director and chief of race track engineering, and Red Bull's head of strategy Neil Martin, who now heads up a new department at Ferrari called operations research. Newey joined Red Bull in 2006, when they were running in the midfield, on a salary reputed to be $10m, which is more than most F1 drivers earn. Since then, the team have structured their engineering department around him and the result has been the quickest car in F1 for the last two seasons. 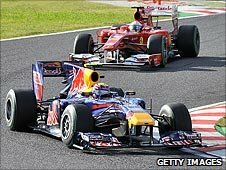 Red Bull fell short of the title in 2009 but last year won both the drivers' and constructors' titles after an intense year-long battle with Ferrari and McLaren. Red Bull's Sebastian Vettel became world champion after overhauling Ferrari's Fernando Alonso at the final race of the season in Abu Dhabi. 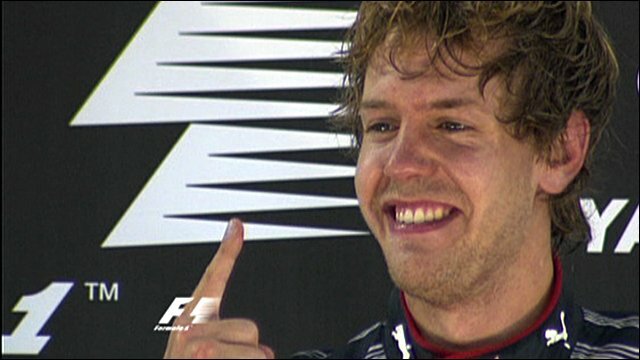 The German won the race and took the title by four points after a strategic error by Ferrari left the Spaniard stranded down the field. Alonso eventually finished the race seventh. It made Newey the first man in history to have led the design on title-winning cars for three different teams. Newey's break into F1 came with the Lleyton House team in the late-1980s and after impressing rivals with his cars there he joined Williams in 1990. The team went on to dominate much of the 1990s, winning four constructors' and three drivers' titles while Newey was still with the team, and another double in 1997 after he left Williams in December 1996 with much of the design of the car finished. After spending six months on 'gardening leave', Newey's arrival at McLaren, in August 1997, transformed the team into a major force after years of struggling to regain its winning form of the 1980s and early 1990s. The team won two consecutive drivers' titles with Mika Hakkinen in 1998-99 and the constructors' in 1998. But although they came close in 2003 and 2005, they did not win another until Newey left to join Red Bull. Newey is renowned in F1 for his ability to understand exactly what is needed to make a racing car fast, and is said to have an intuitive feel for the critical airflow around a car. Ferrari, who dominated F1 in the first half of the 'noughties', have been racing cars designed by Newey for more than 20 years and appear to have come to the conclusion that it might be easier to win with him than against him. For the foreseeable future at least, though, they will have to be resigned to him being their competition. In an interview with F1 Racing magazine earlier this year, Newey said: "I'm very happy at Red Bull. It's flattering if people rate the work I do but that's not why I get out of bed in the morning. I do it because I enjoy the design challenge of F1. "I've had offers from Ferrari in the past and I've considered them seriously. But F1 is a people sport, not a marque sport. "Working for Ferrari just for the sake of working for Ferrari isn't something that I'm interested in."